There need be no contradiction between high driving dynamics and low fuel consumption. 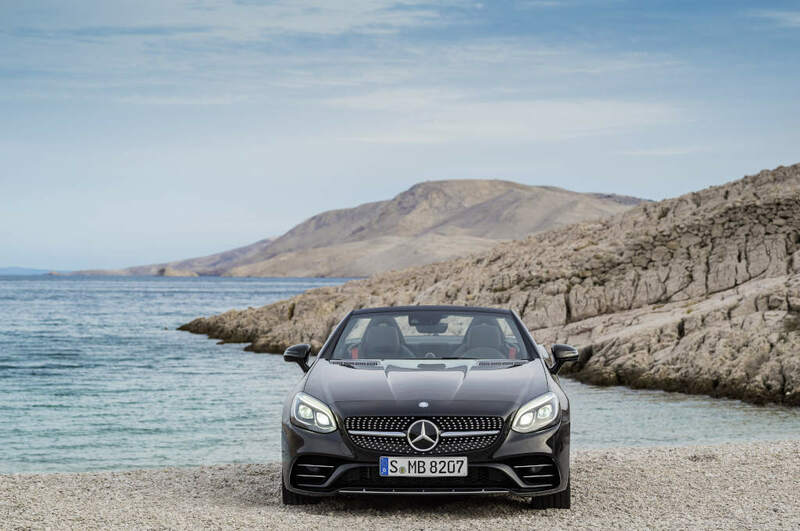 This is proved by the new Mercedes-AMG SLC 43: thanks to the combination of 3.0-litre V6 biturbo engine and 9G-TRONIC sports transmission, the 270 kW (367 hp) roadster consumes just 7.8 litres of fuel per 100 kilometres (NEDC, combined). 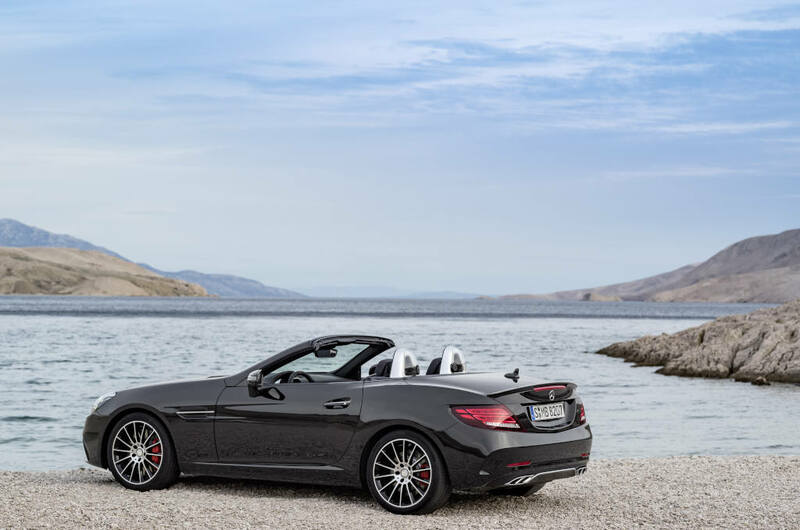 Consequently, the open-top two-seater not only uses 0.6 l/100 km less than its predecessor, the SLK 55 with V8 naturally aspirated engine, but is also the most efficient six-cylinder performance roadster on the market. The specially developed suspension and model-specific mountings for engine and rear-axle gear unit are designed for high lateral acceleration and low roll. 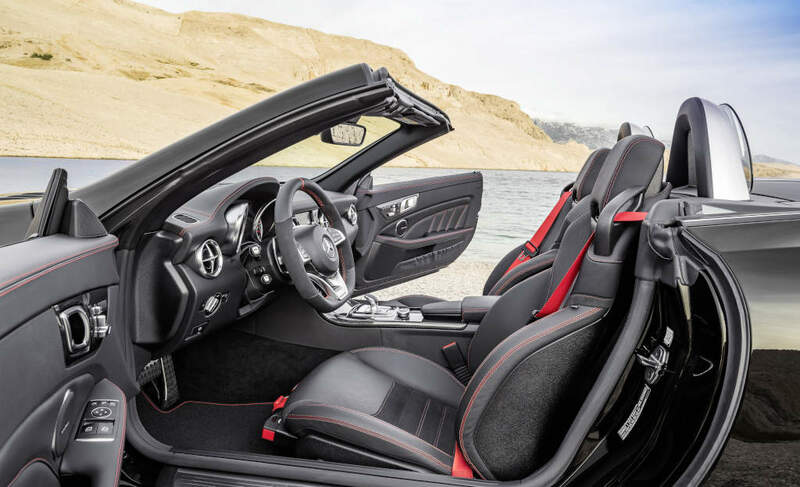 Even greater driving dynamics is optionally available with the AMG RIDE CONTROL suspension with adaptive adjustable damping and the Handling package with mechanical limited-slip differential on the rear axle. 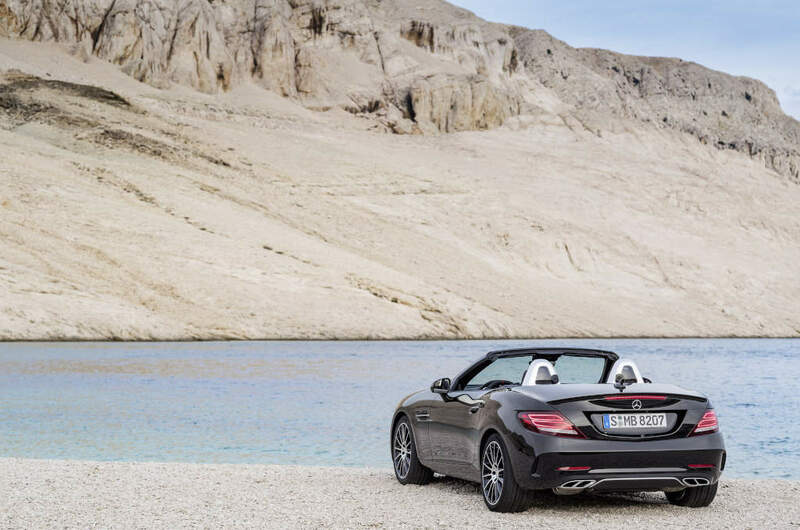 Compact, powerful and economical: “The new Mercedes-AMG SLC 43 unites the classic virtues of a roadster with exemplary efficiency. 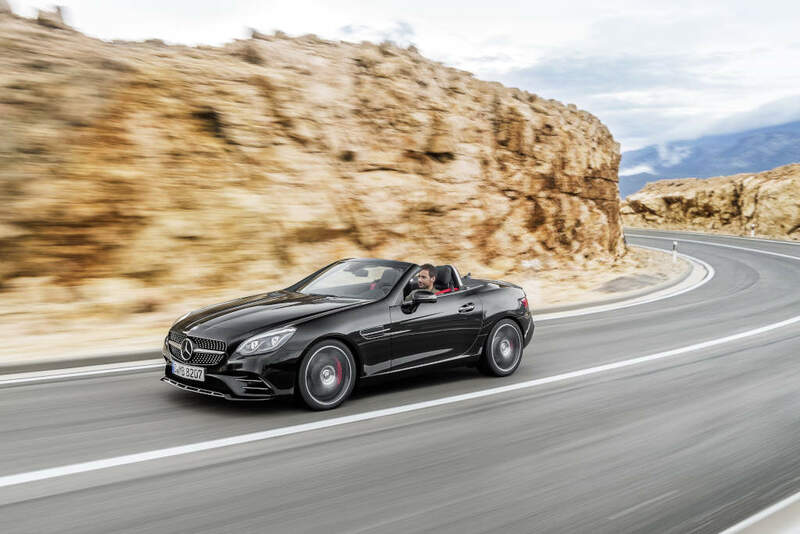 Weighing less and with lower fuel consumption, the new SLC 43 delivers a similar performance to the SLK 55 on the race track. 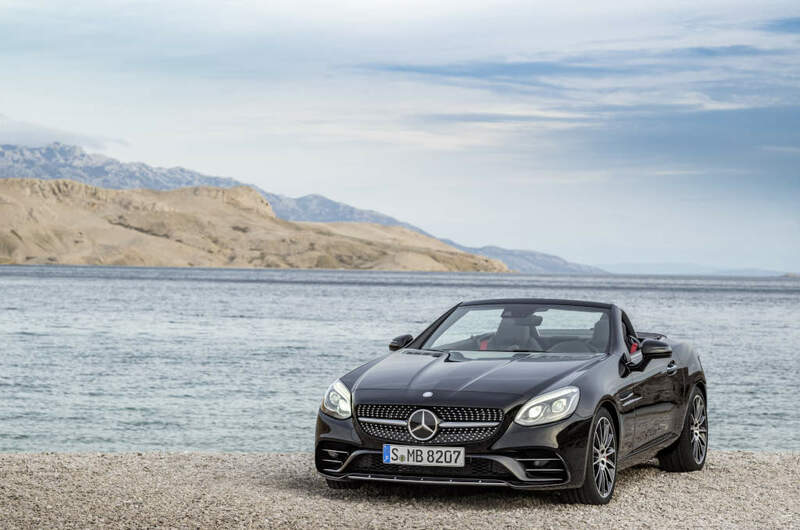 This vehicle provides typical AMG driving pleasure in a compact open-top two-seater in line with the needs of today’s market,” says Mercedes-AMG chairman Tobias Moers. 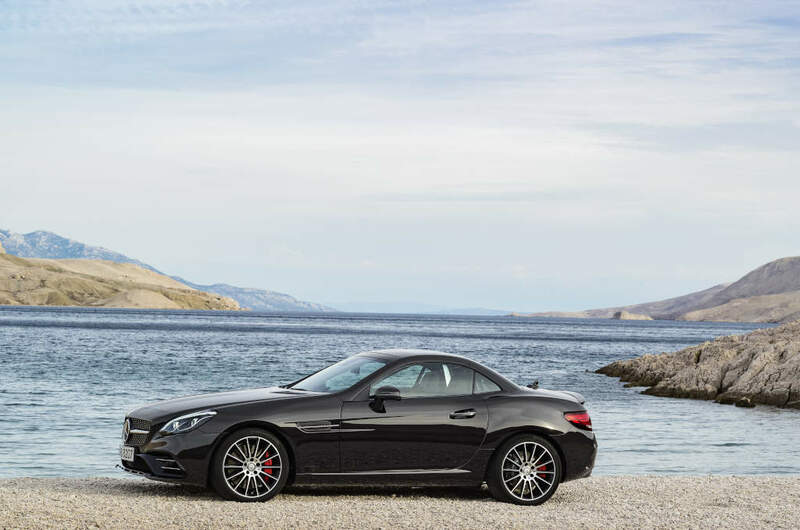 The 9G-TRONIC sports transmission is specially matched to the demands of the SLC 43. 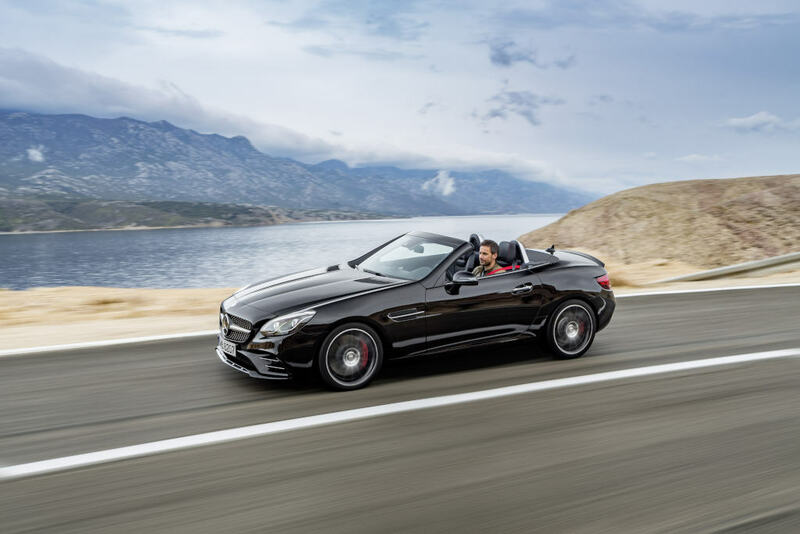 By specifically adapting the software, the AMG developers have been able to significantly shorten the shift times. The multiple downshift allows even faster short bursts of speed, while the double-declutching function in the “Sport” and “Sport +” transmission modes makes for an even more emotive driving experience. In “Sport +” mode, partial ignition interruptions provide even faster gearshifts. The standard-fit shift paddles allow lightning-fast manual shifting of the automatic transmission without the driver needing to take their hands off the steering wheel. 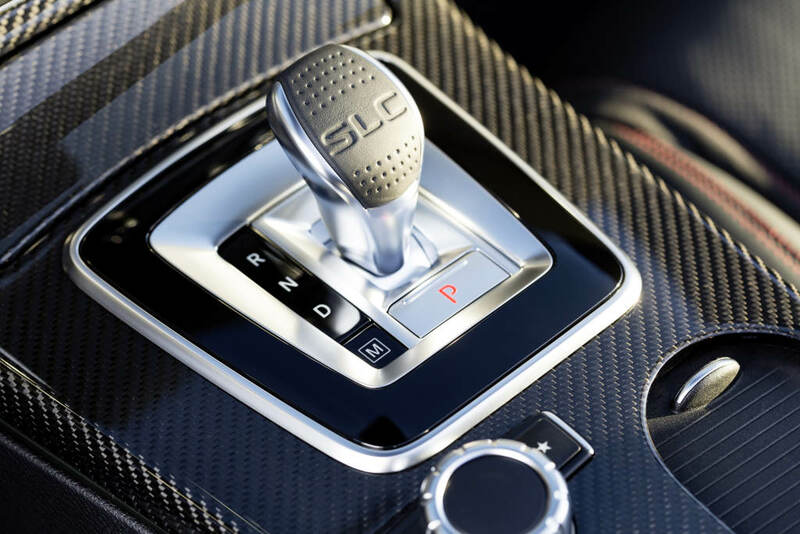 Shifting in “Manual” mode, which is activated using a separate button next to the selector lever, is twice as fast as in the other transmission modes. Also, the transmission stays in the selected gear and does not automatically shift up when the engine speed reaches the limit. 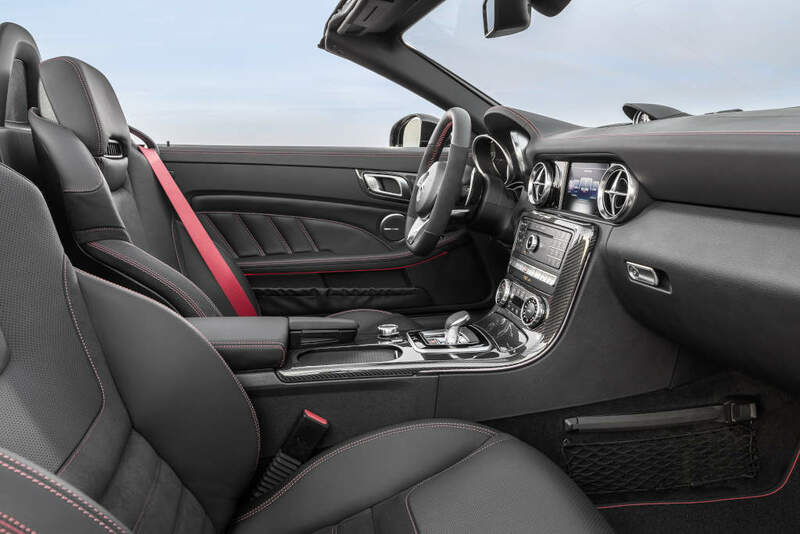 With its automatic adjustable damping system, the optional AMG RIDE CONTROL sports suspension allows an even more personalised suspension set-up, with each wheel being individually electronically controlled. The three suspension settings “Comfort”, “Sport” and “Sport +” can be selected by the driver via the transmission modes using the DYNAMIC SELECT button. “Eco” transmission mode: all parameters are programmed for maximum efficiency. The ECO start/stop and coasting functions (overrun mode for fuel-saving vehicle operation) are activated. “Comfort” transmission mode: comfortable and fuel-efficient driving, e.g. thanks to early upshifts. Suspension and steering are set up for an emphasis on comfort. “Sport” transmission mode: sporty characteristics thanks to a more agile response to accelerator commands, shorter shift times, earlier downshifts and more emotive gearshifts owing to double-declutching. A more dynamic set-up of suspension and steering. “Sport +” transmission mode: extremely sporty characteristics thanks to an even more agile throttle response, increased acoustic emphasis on double-declutching on downshifts as well as selective torque control on upshifts with cylinder suppression for optimal shift times. Increased idle speed for faster pull-away. An even more dynamic set-up of suspension, steering and drivetrain. “Individual” transmission mode: personalised set-up of drive, suspension, steering, air conditioning and ECO start/stop function. Independently of the DYNAMIC SELECT transmission modes, the driver has the option of pressing the “M” button to switch directly to manual mode, in which gearshifts are executed exclusively using the shift paddles on the steering wheel. 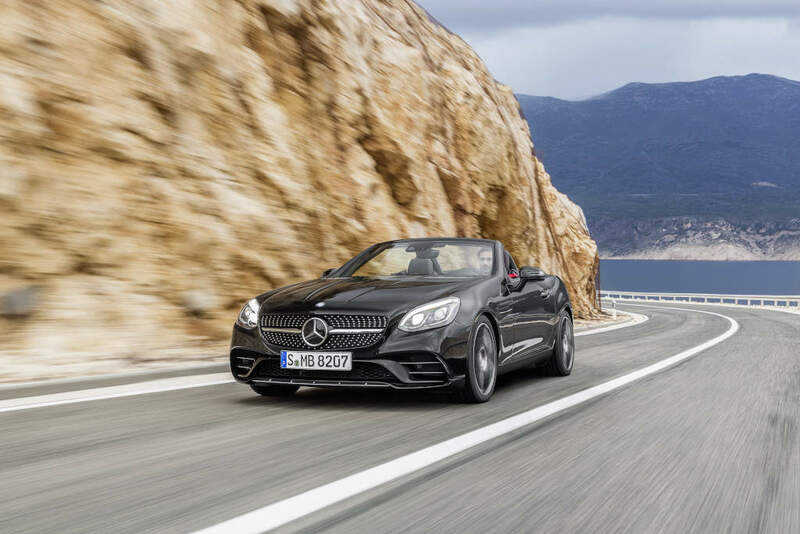 With its permanent, direct transmission ratio of 15.5 : 1, the speed-sensitive sports steering supports the new SLC 43’s agile cornering while additionally impressing with its precise, highly authentic feedback. The steering power assistance is variable with two modes (Comfort and Sport). It is automatically activated depending on the selected DYNAMIC SELECT transmission mode or can be personalised in Individual mode. 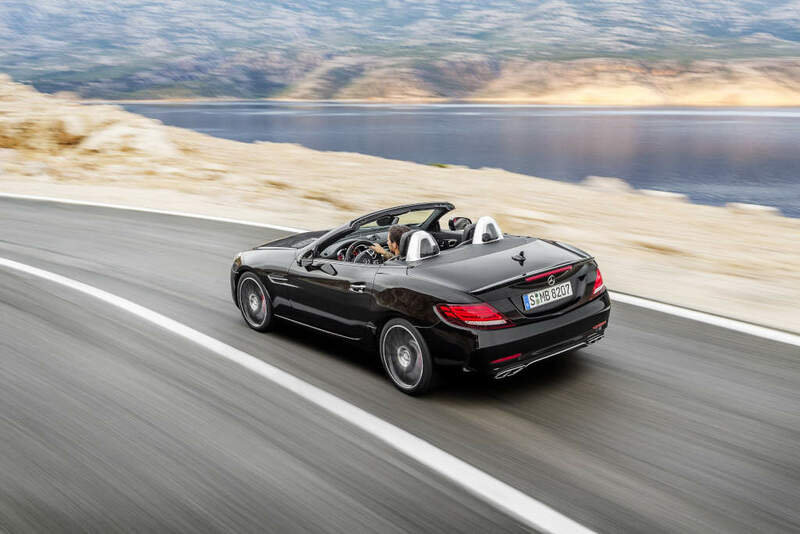 The new SLC 43 also meets the personal wishes of the driver when it comes to acoustics: the standard-fit sports exhaust system comes with two automatically map-controlled exhaust flaps. 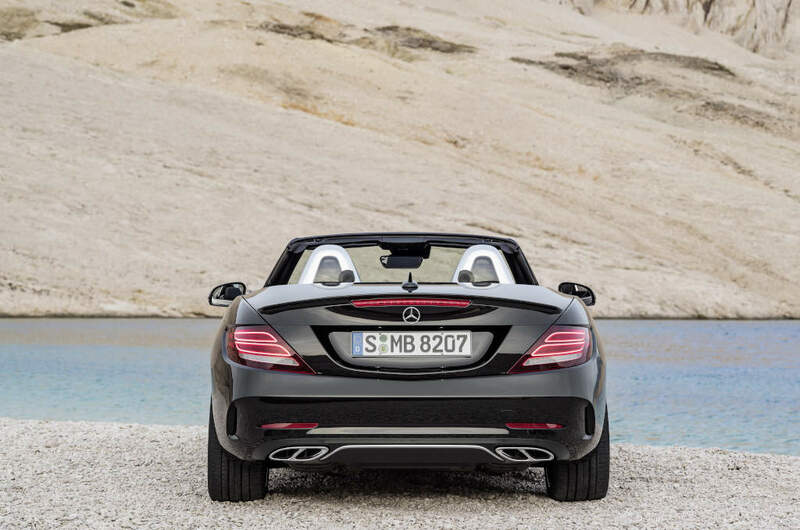 In the “Eco” and “Comfort” transmission modes, the flaps remain closed most of the time, this resulting in an acoustically restrained note from the six-cylinder biturbo engine. 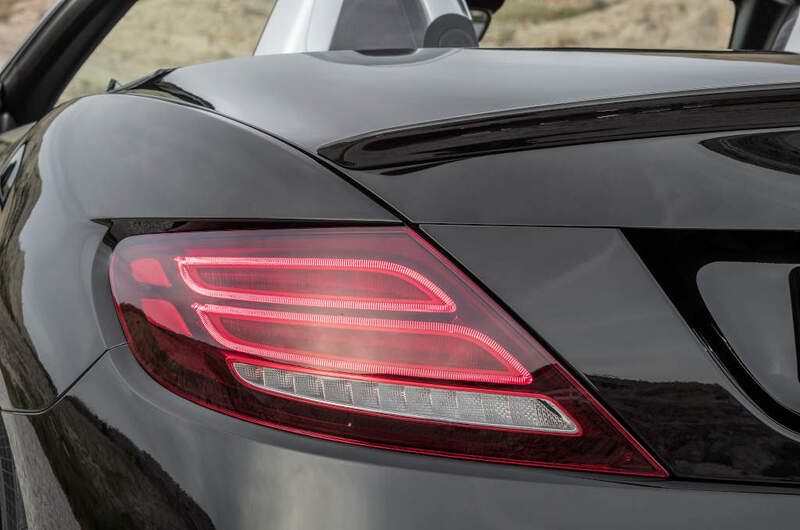 In the “Sport” and “Sport +” modes, the exhaust flaps open earlier and more spontaneously, especially if the driver prefers a dynamic driving style. 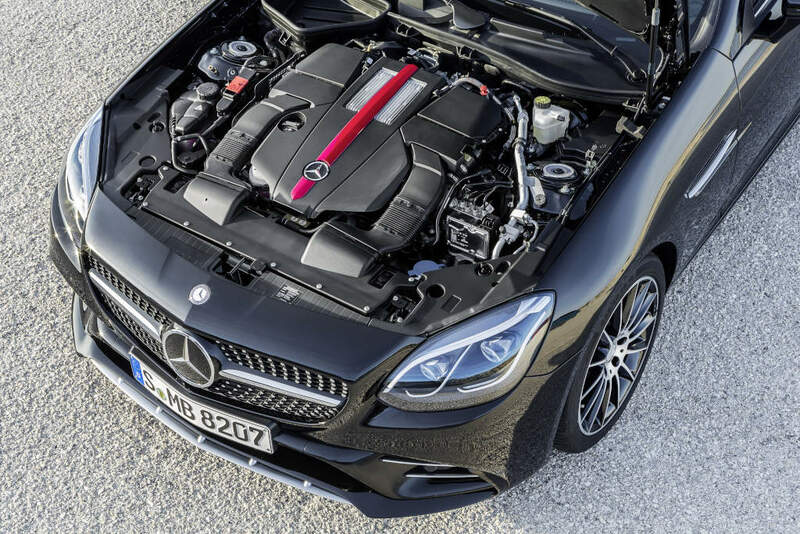 The effect: the typical, emotively appealing AMG engine sound. The statutory noise prevention limits are met in all transmission modes. 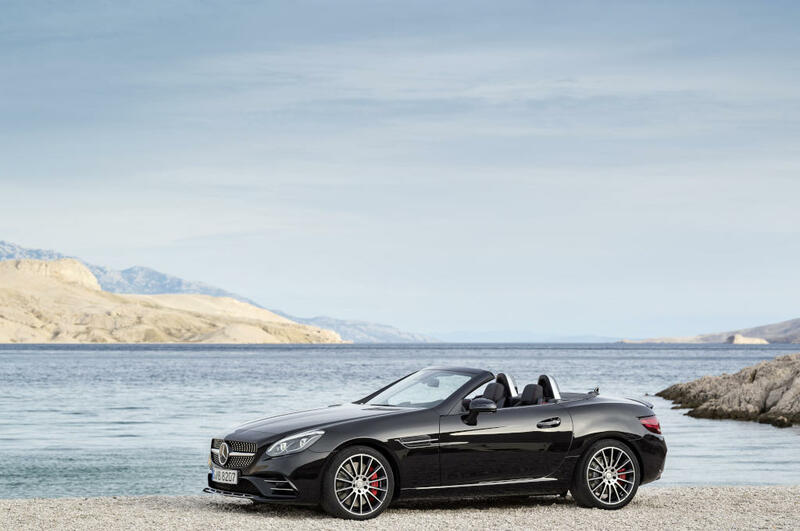 Numerous design features immediately identify the new SLC 43 as a member of the Mercedes-AMG family. With an emphasis on width, the front view is dominated by the air deflector in brand-typical “A-wing” form, which is in high-gloss black. The large outer air intakes come with silver chrome fins and are edged by black flics. 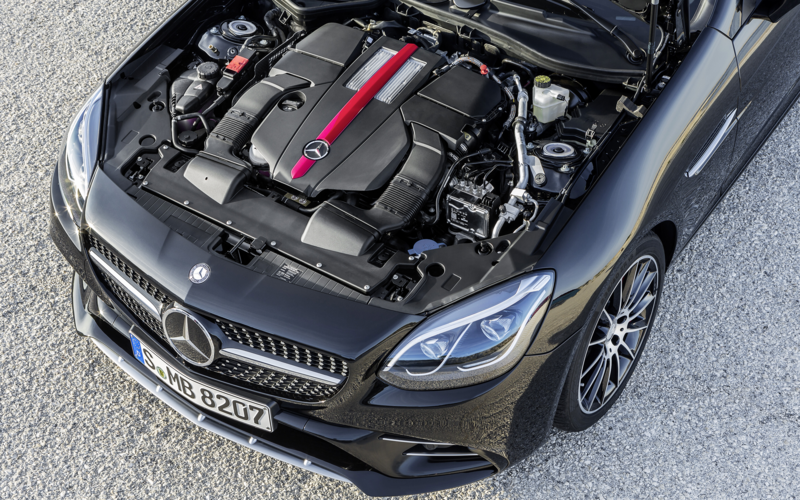 Down below, the silver chrome front splitter ensures an optimal flow of air to the cooling modules. It also makes the roadster appear hug the road more closely. The diamond radiator grille features chrome-plated pins and a louvre in high-gloss black. The new SLC 43 offers even further scope for individualisation with selected options, these including the Handling package, which comes with features designed to support an ambitious driving style on the racing circuit. They also include the mechanical rear-axle limited-slip differential and an additional engine radiator at the front. 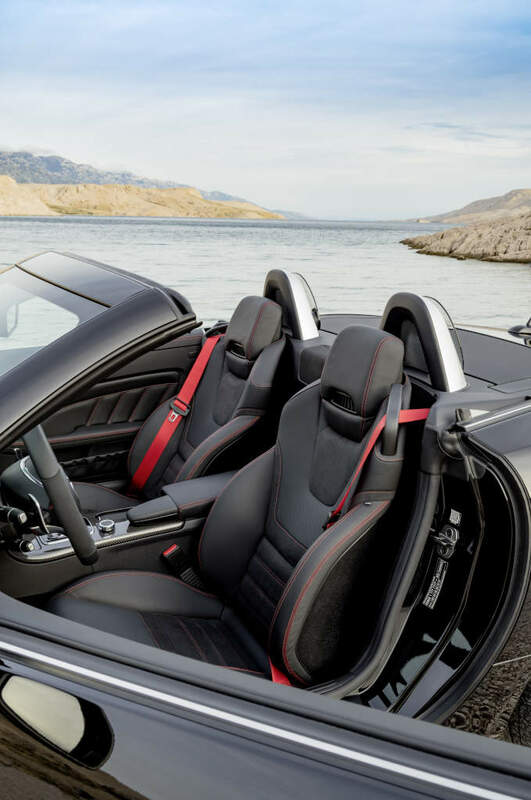 The vehicle’s proximity to motor sport is visually underscored by red-painted brake callipers, a Performance steering wheel in nappa leather with DINAMICA microfibre in the grip area and red topstitching as well as an analogue clock in IWC design.